There are many ways one can make lists to become more productive. Let me show the most efficient ones with 4 questions. To become more productive you’ll have to make lists, period. By categorizing everything you need and have to do, you gain visibility and the chance to plan your days better. When you make lists, you are also freeing your mind. Instead of repeating to yourself you have to complete a particular task or attend an important meeting, just record it somewhere. Once you save your appointments and tasks, you don’t need to worry about them anymore. The stress of forgetting about your partner’s birthday, your kids meeting at school or that due date goes away. But I’m sure that the importance of making lists is nothing new to you. How do these lists look like? What should be on these lists? How should you organize them? There’s a difference between doing something because someone told you so and doing something because you know exactly how beneficial it’s going to be to you. With lists, it’s no different. You shouldn’t make lists only for the sake of adding another task to your routine. 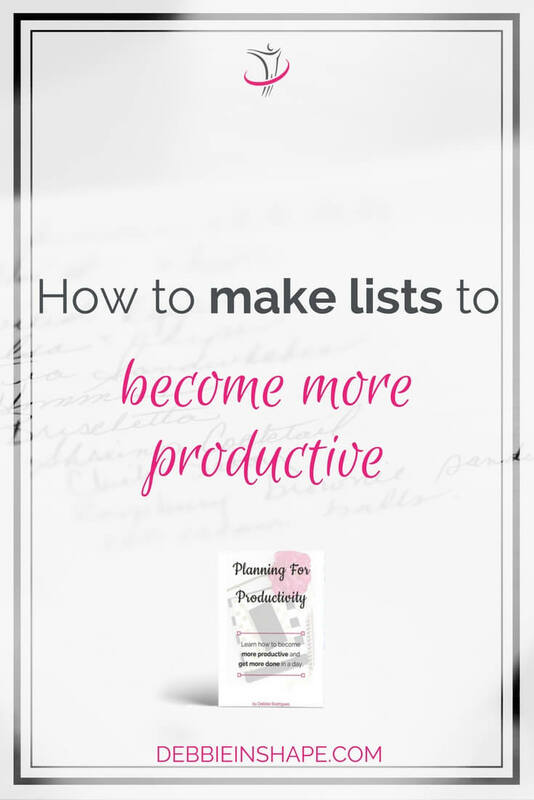 If your goal is to become more productive, you want to create lists efficiently. Does it sound too much to ask? Don’t worry! That’s what I’m going to show you today. If you’re brand new to planning, it’s OK just to have a list or two. You’re still taking the first steps of building the habit of organizing your tasks and creating a schedule. But even if you’ve have just started, there are some things you should keep in mind. You don’t need to write all details of a task on your list. “Return X’s call” is all information you need on your to-do list. If there are subjects you must discuss during the call, make your notes separately. Writing too many details here will only create chaos. I love color coding things, what about you? While colors are helpful to classify your tasks, be careful when creating your system. If you need to use more than 3 pens for your first planning system, maybe you should rethink it. You don’t want to risk not having the “right” color at hand when you need it. And if you use another one, you won’t be able to trust your schedule anymore. There are no fixed rules about how a perfect list should look like. If you search Pinterest, you’ll find numerous ideas. All the authors claim their solution is the best for them. They may also be ideal for you. Before anything, I want you to clarify your intention about becoming more productive. Make sure you check the previous blog of this series about setting goals. 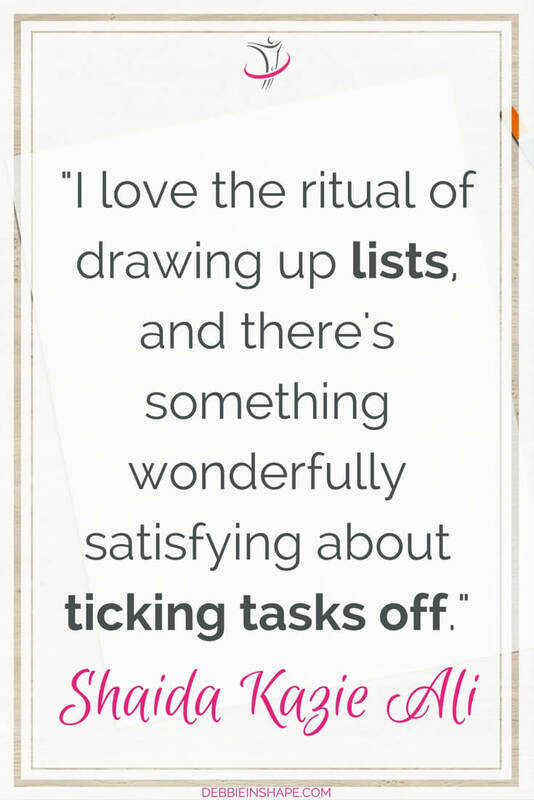 Once you’re through that, it’s time to make lists the efficient way. How do these lists look? First of all, you want to capture as much as information possible without overwhelming a specific list. It’s better to keep specific lists for each topic you need to cover. Take the time to brainstorm a list structure that fits your needs. There’s no reason to rush here. If necessary, try different methods for a week or more before making your final decision. Don’t let perfection delay your start, but don’t get too attached to your first attempts either. Since our goal is to become more productive, you shouldn’t spend too much time making lists. There’s absolutely no need for detailed explanations or complex systems. Whether it’s your list of tasks or grocery shopping, anyone who has a look at it must be able to understand exactly what you mean. Make lists that are easy to read and simple to maintain, whatever it might mean to you. Some people feel more comfortable with color coding and/or signifiers. If that’s not your case, though, just drop the idea. On your lists, you must be able to find everything you need to complete a particular task or project. Even if it’s only a reference. At first, it may sound overwhelming, but as you start developing your system, you’ll see how efficient it is. One of the reasons for having separate lists for specific topics is to avoid having to deal with inactive tasks and projects. Keep your parked items in a different place from the active ones. Let’s say you have plans for redecorating your living room, but right now, you’re renovating the kitchen. In this case, “redecorate living room” should be parked in the list of future projects. Dump all the ideas that come to your mind somewhere (I love Evernote for that!) you don’t have to look at it every day. Omit from your active lists everything you’re not working on at the moment. The same goes for extensive details. 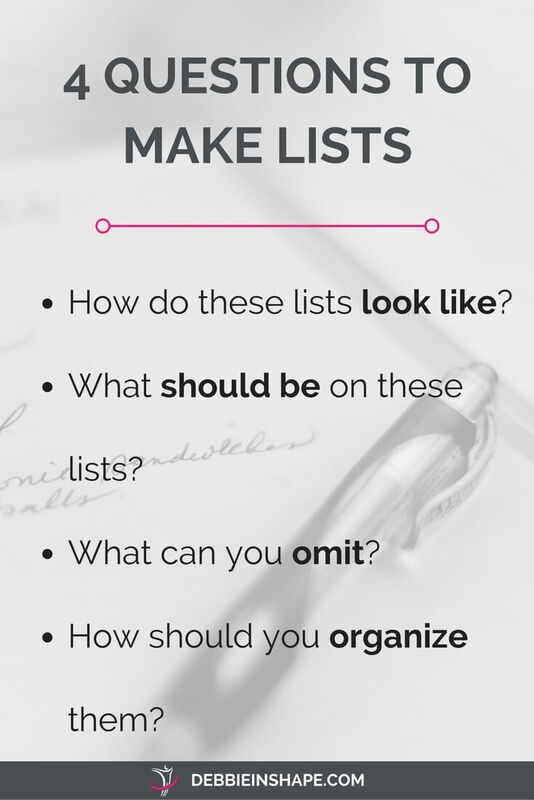 Your personal preference can be the difference between making lists that will work for you or not. Yet, there are some guidelines that will help you become more successful. If you have never tried any method before, I recommend that you start with only one system in the beginning. In time, you may realize it’s not enough to cover everything, and you may add one or two more. In the beginning, when you’re still building the habit of making lists, you don’t want to spread yourself too thin. There are various tools you can use, but my favorite one is Evernote. And that’s just to mention a few of the features you’ll be using right away. With Evernote, you can store everything in one place. Thanks to its search system, you can easily find any information ever added to it. And you can organize your notes the way that fits you best. Start to make lists today. You may not feel confident at first, but that’s normal. Whenever you try something new, there’s always the possibility of not getting things right in the beginning. 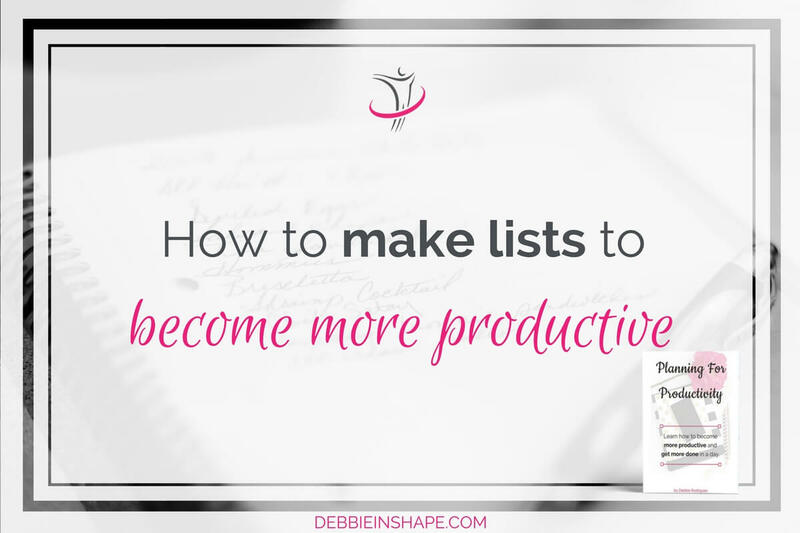 Should you be stuck, in my workshop Planning For Productivity, I share real-life examples of how lists help you become more productive in the various aspects of your life. In Planning For Productivity, I share in details how creating lists helps you do more without stress. To help you stay on track, this course contains a bonus video on consistency. Complete the assignments at your own pace, implement quick-wins and change the way you plan your days. You can find more about Planning For Productivity here. Don’t make lists to stay busy. Their goal is to support your productivity efforts and help you get more done without stress. Disclosure: Some of the links in the post above are “affiliate links.” It means if you click on the link and purchase the item, I will receive an affiliate commission. You will not pay more when buying a product through my link. However, when you order through my link, it helps me to continue to offer you lots of free stuff. Regardless, I only recommend products or services I use personally and believe will add value to my readers. Thank you, in advance for your support!